my pages of Mark with you . over his 22 years of life, and how he lived a purposeful life. starring the beautiful 'ELLA JAI' of course !!! I framed the photo with a compact cluster of beautiful ivory roses .. tucking copper leaves randomly around the edge for a dramatic effect. I dabbed some rusty hinge distress ink on a couple of the roses to create definition . The large Organza flower stands alone as a feature and the white and blue chipboard compliments the elegance of this delish flower. I separated the bottom layer of this flower because I wanted a smaller version in this space . Monochromatic soft pastels hues with a kiss of color (copper leaves) always appeals to me, and I feel it compliments this photo perfectly . I adore the way the leaves are wired as this allows me to bend/twist/fold them which ever way I desire. The simple background is created with a clock mask, inked with blue Versa color, machine stitching around the border and a small amount of doodling. **NEW** Maple Leaves White 4.5cm. Prima paper/fairy Belle collection, Imaginariumdesigns chipboard, prima metal bird cage, kraft and white cardstock Bazzill, crafters workshop mask – clocks, Kaiser blossoms, muslin. I Hope I have inspired you to play with your own cluster of GREEN TARA flowers. What can I say, your textures and layers just grab me every time, as does the beautiful subtle stamping to the backgrounds of your LOs. I just love your scrapping style!! I just love the browns against the white and that cluster of flowers is so so delish. Beautiful work. This is sooooooo beautiful!! I loveeeeeeeeee that precious photo, the Eiffel Tower and loveeeeeeee all the flowers!!!! GORGEOUS!!!! HI Heather.. this is so lovely, and the softness of the colors really just enhances the gorgeous photo.. I love all the flowers.. i always love flowers! !the doodling, the ripped edges, the chipboard.. all and more make this a really beautiful layout.. love it..
Lovely page and great photo too! Hi my friend Heather! I am back from holidays and came by to say hi & get inspired of course!!! I love your cluster and the romantic feeling of this layout! Great color combination! I love it!!!!!!!!! You do brown tones soooo well. Stunning! Beautiful, simply beautiful! Love the colors and gorgeous array of flowers...looks so pretty! gorgeous!!! 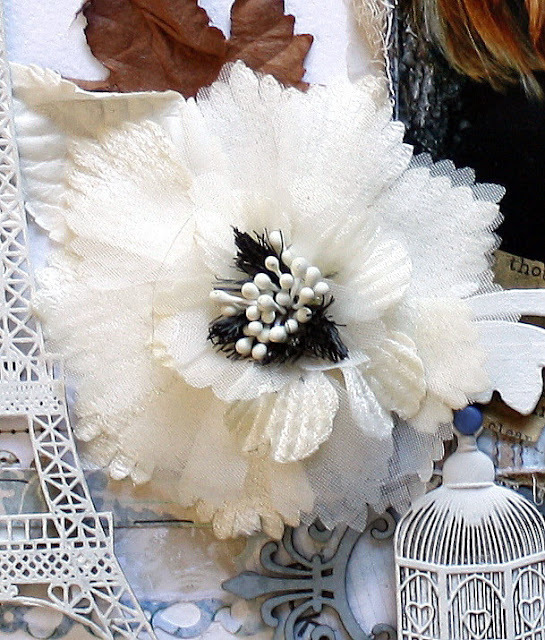 the flower cluster is simply amazing, and that eiffel tower...love it! Great layout. I have my grand daughter here. Hoping this serves as inspiration for my pics of her visit. Love the colors. Thanks as always for sharing. So amazingly delicious, all them beautiful elements and flowers.... such a pretty little girl, you are blessed Heather... in your creating! Congrats on your GDT at Green Tara - you lucky fish - getting to work with all those gorgeous blooms! Simply stunning layout Heather! !